“What Good Does It Do” was written for the Broadway musical Jamaica, which starred Lena Horne and Ricardo Montálban; the principal dancer was Alvin Ailey. Yarburg had been blacklisted during the McCarthy period and was unable to work in film or TV from 1951 to 1962. Fortunately, producer David Merrick and Broadway welcomed Yarburg. 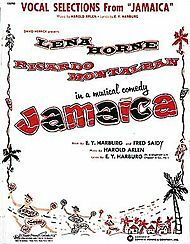 Jamaica was nominated for major Tony Awards, including Best Musical, all the acting nominations and both scenic and costume design, though it lost to The Music Man. Does it do, does it do a guy. This song was recorded on August 18, 1960 and released in 1960 on the album Tony Bennett Sings a String of Harold Arlen. “What Good Does It Do” was recorded live at Tony Bennett’s concert at Carnegie Hall on June 9, 1962 and was initially released in 1962 on the album Tony Bennett at Carnegie Hall. Ralph Sharon arranged the song.